Changes in diesel fuel mean new challenges to the owners of diesel fuel powered cars and trucks. Ultra low sulfur diesel can cause issues related to cold flow, lubricity and fuel economy much like those experienced during a switch to low sulfur a few years ago. Cold flow will be additionally affected by the anticipated lack of low sulfur kerosene for winter blending. Castle®, working with the world leaders in the diesel fuel additive industry, has put together the most advanced diesel fuel treatments available to treat both low and ultra low sulfur diesel fuels. These are not “tweaked” formulations of old technology, but new state of the art formulations with proven credentials of performance. 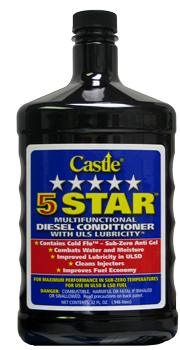 5 Star™ not only improves fuel economy and stability, but also helps to keep your engine running cleanly and efficiently. It will reduce exhaust emissions, clean injectors, increase cetane and corrosion protection, reduce power loss, and is an upper cylinder lubricant. In addition to these benefits, 5 Star™ contains cold flow improvers to enhance the fuel’s cold flow properties when it’s in sub zero temperatures, making it the perfect choice for cold weather dwellers. Add to tank prior to adding fuel. Use for one month before the onset of cold weather and throughout cold season.